Frank Hamrick is an associate professor at Louisiana Tech University. His work mixes photography, storytelling, handmade books and found objects. Hamrick received his BFA from The University of Georgia and his MFA from New Mexico State University. NPR has written about Frank’s handmade books, and Oxford American Magazine listed Frank as one of the 100 Superstars of Southern Art. His work is housed in collections including The Art Institute of Chicago, The Amon Carter Museum of American Art and The Ogden Museum of Southern Art. There will be a Closing Reception on September 21, at 6pm, and an Artist Talk, including Frank Hamrick, on Saturday, September 22, at 2pm. According to your statement, you accidentally were introduced to making tintypes because one of your students was having trouble with the process. Learning this process yourself, you now have a series of photos, some of which showing at the APG exhibit. 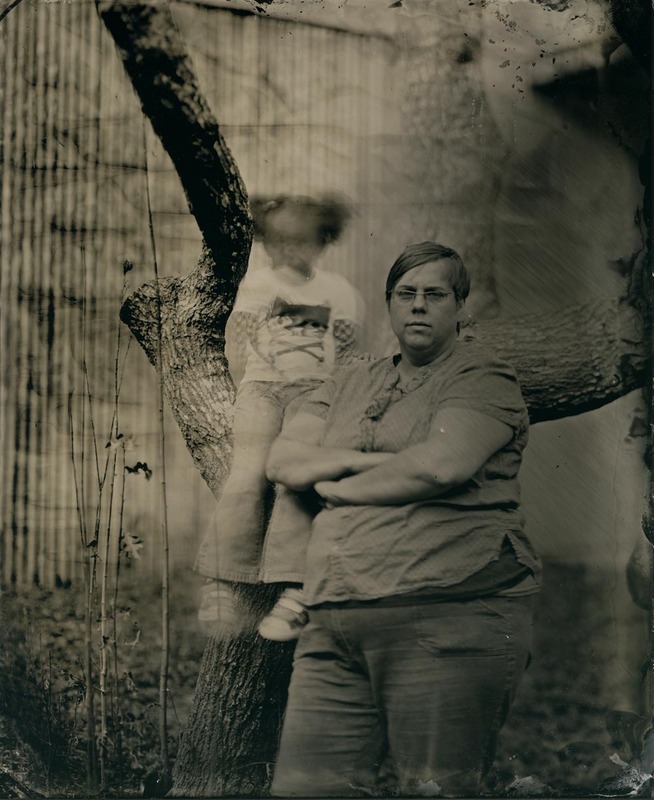 What attracts you to this tintype method? 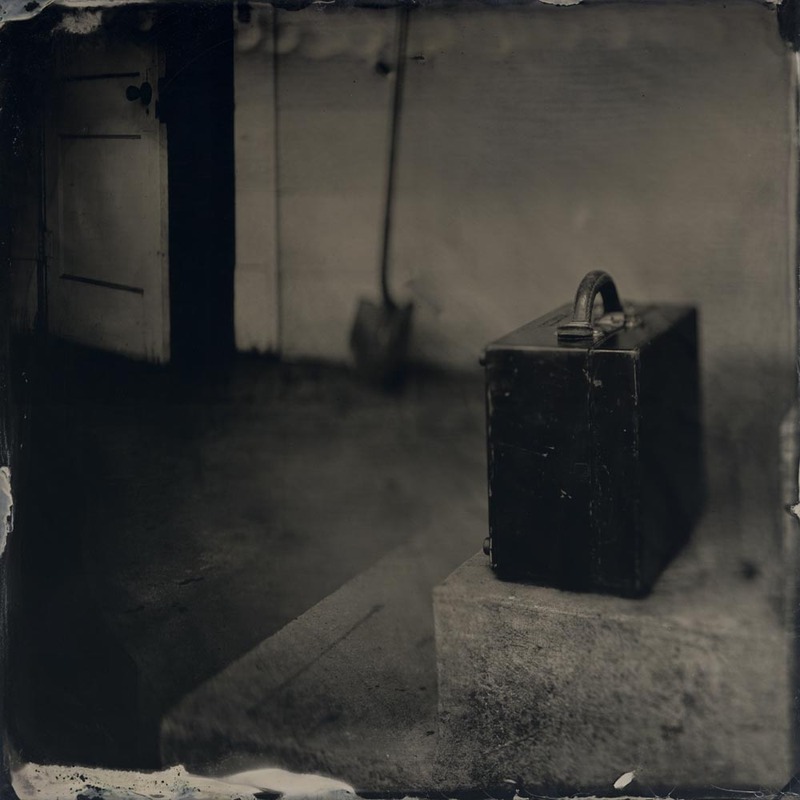 In some cases, the tintype process forces me to consider subjects I would normally overlook and it forces me to approach familiar subject matter in a different way. My exposures have ranged anywhere from 1 second to 6 minutes depending on the age of the chemistry, the time of year and the weather conditions. Also working with an 8x10 camera and tripod requires me to plan ahead whereas with my smartphone, I can quickly make numerous images spontaneously. Many people think of photography as capturing fractions of seconds when really photography is about capturing light over an undetermined amount of time. 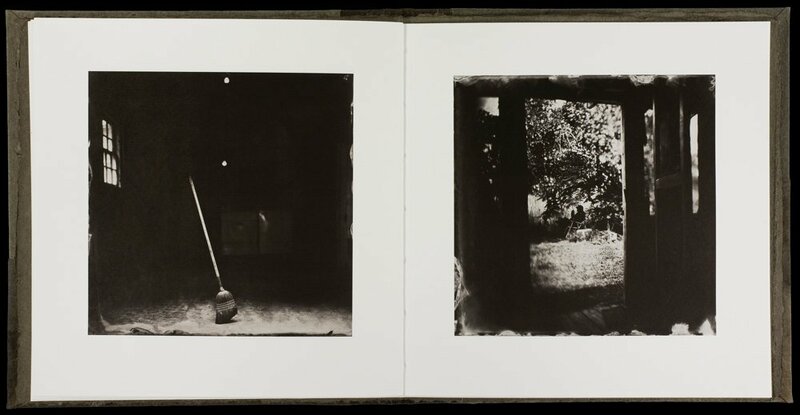 Tintypes stand out from most contemporary photographs because they are capturing longer periods of time and make both photographers and viewers think about time, photography and the subject matter differently. I once photographed my photo peer Libby Rowe with her daughter, Violet. Libby was about 40 at the time and Violet was four and they had to pose for 40 seconds as the light was fading at the end of the day. Libby was leaning up against a tree that Violet was perched on. Libby was rock solid still while Violet’s head and legs were blurred from looking around and kicking her feet in the air. 40 seconds is not much to an adult but is unfathomable to a small child. Rather than showing what Violet looked like at that age, it captured how she acted in comparison to her mom, the overflowing, anxious energy of a child in contrast to the stability and patience of a parent. Memory and time seem to be in play regarding the process of tintypes (long shutter time, old look on contemporary photos), what about the subject in your photos? I never try to make my photographs look old. There’s never a guy in a civil war coat with a musket. What I do strive for is to make images that are timeless. I want the photograph to be relevant now and decades from now. In some cases, they look like they could be from today or 50 years ago. I have no desire to make photographs of people in tight pants with Justin Bieber haircuts. I try to avoid trendy subjects in the work because I do not want the photographs to age quickly as trends tend to do. In your statement you say the pieces you make have particular meaning to you, whatever the audience may see. What do the photos in the show mean to you? Some of the photographs in this show are of close friends, which makes them have a significance that is unique to me. One image has a blurry dog that is no longer with us, so that means a lot to me. In some cases, I created a scene in the same way a child plays make believe, while in some I just recognized something that I believed would make a good image and took the time to capture it. Some of these photographs were inspired by an incident I heard about in graduate school of a man trying to get home and all the things that made that a challenge. So, the trail, the suitcase, the male figures all relate back to that story. Your art doesn't stop with the photos; you create handmade limited-edition books of your photo series, creating a new art object. What makes you do that? I think of images in the same way as songs heard on the radio. “Like a Rolling Stone” is great, but it does not convey everything Bob Dylan does. Larger bodies of the artists’ work must be studied to fully grasp their range. I compare artist’s books to full albums of music complete with cover art and liner notes. Holding and viewing a book, especially a handmade book covered in cotton rag paper, is an intimate experience that is different from standing back and viewing photographs on a wall. Books are both time-based art and functional objects. The title of your book containing the photos showing in this exhibit is my face tastes like salt. All your books have seemingly random titles. Can you explain? All but one of the photographs in this show and in the book My face tastes like salt were made in the summer and are about moving through and interacting with the natural world. The title phrase is something my nephew said when he was a child and was sweaty in the summer. I made the book Madalyn a few years ago as a fundraiser to help some with my niece’s college tuition. I planned on doing something similar to help her little brother, my nephew, Copeland, when he started college. The Madalyn book was mostly portraits of her throughout her youth, but I did not want to do the same thing to help my nephew. So instead I included his portrait in the last three editions of artist’s books. The title phrase related back to his childhood. Many of my book titles are meant to make people wonder, to give them a starting place and point people in a direction without telling them where to end up at. The previous book, Harder than writing a good haiku, was something I said when helping other photographers who were struggling to edit their work down to a number of prints that would fit on a limited amount of wall space. Sometimes you do not have room to show the entire 20 or 50 images in the body of work and it can be difficult to narrow the images down to eight or ten and still get the idea across. It can be harder than writing a good haiku. To keep with the theme of haiku, there were 17 images in that book. The next book I am doing will be called It was there all along. Which artists do you have on your own walls, who do you collect? I collect more artists than I have room for on my walls. I have photographic work by Jay Gould, Andy Bloxham, Zach McCauley, Hannah Cooper McCauley, Jaime Aelavanthara, and also printmaking and letterpress work by Jim Sherraden and Heather Moulder as well as drawing and paintings by Nicole Duet and Christine Shank.